Generally, in a Batman story, the Joker is depicted as an unpredictable force of pure chaos and madness, making him an impossibly dangerous foe for anyone who is not as brilliant or as well-trained as the Dark Knight himself. Yet, nearly every version of the Joker we’ve ever seen hits a couple of reliable aesthetic notes: He has green hair, he has white face paint, and he wears a purple suit. 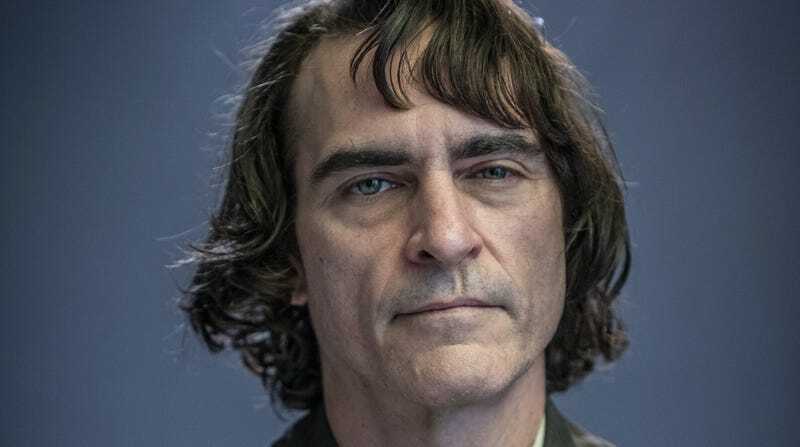 For his Joker movie, though, director Todd Phillips seems to have hit upon a truly terrifying idea by making Joaquin Phoenix a Joker who doesn’t even play by the Joker’s established rules. We’ve already seen the green hair and the white paint, but—in one of the most disturbing, hauntings twists we’ve ever experienced—we now know that Phoenix’s Joker does not wear a purple suit. No, you do not need to adjust the settings on your computer monitor or cellphone screen. That is indeed the Joker wearing a red suit with an orange vest (you can see more pictures at People). Jared Leto’s Joker had the word “damaged” stamped right on his forehead, but is there anything more “damaged” than that image right there? That is one unpredictably chaotic clown if we’ve ever seen one, and it raises all sorts of questions about what direction Phillips and Phoenix are going with the character. Is he colorblind? Like, does he think this is a purple suit, and he’s going to flip out and stab people when they try to tell him it’s not? Will there be a dramatic moment near the climax where the Joker barges into the ACE Chemical Plant and falls into a vat of blue dye that turns his outfit into a different color? Or, most chillingly of all, is this some kind of branded content from the people at Slack? After all, he’s wearing the colors of its logo, so maybe this is actually going to end up being a big ad for Slack during the Super Bowl and this stuff about a Joker movie is just to throw us off the trail. Either way, it would be a good idea to stay away from a criminal clown who can’t even do us the courtesy of wearing a purple suit. An engineer got Slack to run on a Super Nintendo, so now we never have to stop working!